I've shared the last of my pregnancy photos on the blog, and our baby boy has arrived, so now I get to share my postpartum style with you. I use the word 'style' pretty loosely! When you have a newborn, your world revolves around them and getting dressed each day isn't always manageable, or something instagram or blog worthy! But with two boys under two, there are some days you do have to get out of the house and some even better days where you manage to wear something clean you feel good in. I'll be sharing some of those pictures on the blog when I can. The anticipated autumn weather hadn't arrived with the changing of the seasons, so my first few trips out I stuck with my summer pregnancy uniform - shorts, singlet and kimono. Just wearing nursing singlets instead of maternity singlets. Wore this for one of our first trips out post-baby! Had to stop by our local child health clinic after we were discharged from hospital to get baby boy enrolled and ask some questions. When toddler T was a baby we spent a lot of time at the clinic, getting lots of help, advice, going to free sessions and having weekly weigh-ins. I've shared before what a great free service it is - we really are so lucky to be able to drop by any day of the week in the newborn days. Last worn: Ray-Ban Wayfarers, Somedays Lovin' kimono, Jeanswest breastfeeding singlet, maternity boyfriend shorts, Havaianas, Balenciaga day bag. Other ways to wear: Somedays Lovin' kimono and a maxi skirt, Jeanswest breastfeeding singlet and skinny jeans, maternity boyfriend shorts and LV speedy bag, Balenciaga day bag and maxi dresses. Wore this out for a trip to the local ABA (Australian Breastfeeding Association) meeting. We'd had an appointment scheduled for later that day that was cancelled, so we were able to go to the meeting at the last minute. I was pretty happy as the session was about baby massage, which is a lot of fun for all involved. Even if toddler T wanted to play with the toys instead and baby boy slept...I practiced the techniques on a nearby doll! Last worn: RayBan wayfarer (above), tribal print kimono, black nursing singlet, maternity denim shorts (above), Havaianas (above), Balenciaga day bag (above). 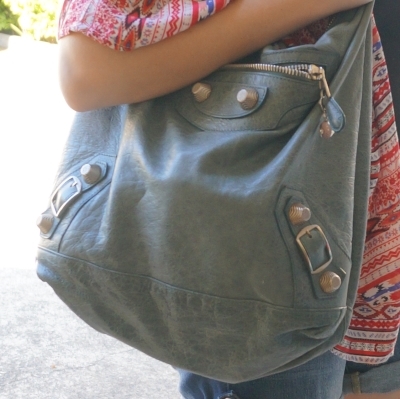 Other ways to wear: tribal print kimono and skinny jeans, black nursing singlet and a maxi skirt, maternity denim shorts and a plain tank, Balenciaga day bag and skinny jeans. Linking up with Hello Monday, Shoe and Tell, Style Sessions, Turning Heads, What I Wore, Fresh Fashion, Style Me Wednesday, Thursday Moda, A Labour of Fashion, Throwback Thursday, Fashion Files, Weekend Link Up. Kimonos are so fun to wear in the summertime. I love all the different patterns that they come with and how the sleeves feel so breezy during a warmer day. I especially love your red-toned one. I really feel like you've nailed the postpartum outfits! Like you say, your focus is on your children but you haven't compromised your style at all - you still look fab! Sticking to the 'uniform' I had in pregnancy has helped! Lovin your looks especially the kimono! I remember you talking about the this before. Sounds like such an amazing service to families. 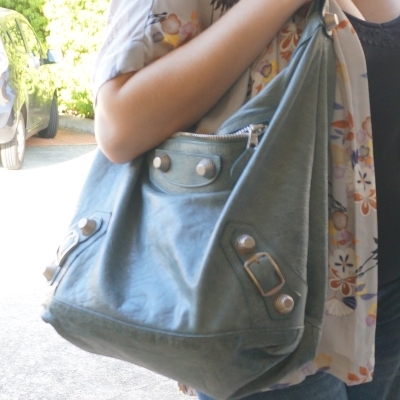 Your looks are perfect for post-baby errands. Love both looks! You look amazing! Very cute! Makes perfect sense that right now your focus is on your family! Thanks Elif! It's good to get out of the house and get dressed now and then! I love the support Australia gives to both babies and mom's. Wish we had that here in the States. LOL Very supportive classes! Love both looks Mica. You're stylish and comfortable. We do have so much support here - it's wonderful. Great postpartum outfits! Like with your pregnancy outfits, I'm really impressed! I know I didn't look nearly as put together after either of my boys was born! 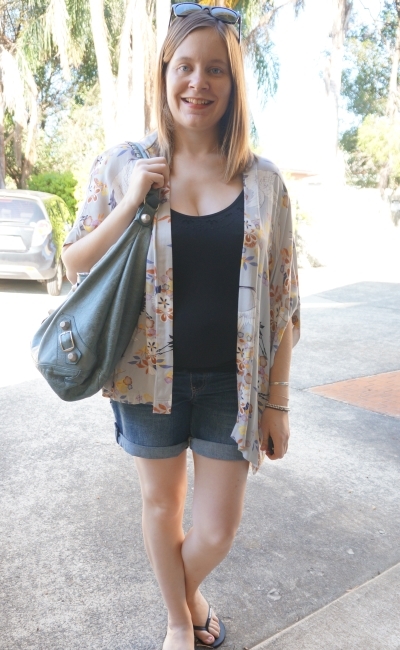 I think sticking to that pregnancy 'uniform', and a great printed kimono, really helps! Changing the outfit up with a kimono works wonders! Love your curly hair in the second outfit! Those kimonos have come a long way dear Mica ! Nicely done. I love how real you are about being a mom and how it's not always easy to look so put together all the time, although that's always the goal! I feel that's where a lot of fashion bloggers who now have babies fail at sharing. It's like their life and style hasn't changed at all. Of course, having a baby may not necessarily effect your personal style, but there are days, I'm sure, when you have an outfit in mind and had to change it last minute because of spit up or it was impractical. It's nice to hear those little tid bits because it makes everything more real and relatable! With that, I love both your outfits! That clinic sounds great and most likely something I'd utilize after becoming a new mom! Thanks so much for sharing, beautiful, and I hope you're having a great start to your Monday so far! haha! I'm so glad you're loving them! :) They are great mum wear! You're making getting yourself ready with 2 small children look easy! You look lovely. I should share the time it takes to get everyone dressed and out the house - not always easy, haha! I'm totally on the hunt for a good kimono! Love that you're still rocking the kimonos--you have such a great collection! I think I'll have to snag a few this summer. You look fantastic too!! They are awesome for summer! lovely casual outfits, I really like both of them. Kimonos and shorts are always a good combo. Congrats to you and your family on the new addition to the family:)!!! Love it! Effortless and chic! Whoa, props to you for keeping so stylish - I know I'm reiterating everyone else but you really do make it look easy. Plus, and I know I've said this before, but your kimono collection is so GOALS (excuse the teenager there lol). I feel like they make everything look effortlessly cute! They are great pieces - and instantly make any outfit looked pulled together I think! Despite your schedule, I think you are rocking this style blog! I love this kimono outfit and I thought your postpartum outfit was cute too! Also, I don't think I said this but congrats on your baby! Love both the outfit Mica! You look fab! I need to pick a kimono sometime so I can feel awesome as you look! I'm jealous of the weather you're having! I love this fashion postpartum tips. I need to keep it mind. Yes it's good to have time to yourself, although not always possible! Love the prints on those kimonos so much!!!! I love the kimonos! beautiful! Congrats, lady! So excited for you! And you are getting right into the boho trend in this kimono! Kimonos and shorts are seriously an ingenious way to stay stylish while juggling all the new responsibilities of a momma! Yes they are such easy pieces to add to an outfit! Mica, you look great!! Love both of those kimonos!! Such a great outfit for warm, sunny and summery days!! I love how you use kimonos to dress up a simple look and give it lots of color, pattern, and style. It's nice to see you back in your almost regular outfits again! I hope you and your little boy are doing well! Loving that kimono style cardigan you have there too! Perfect mum uniform! Amazing job with two under two!! 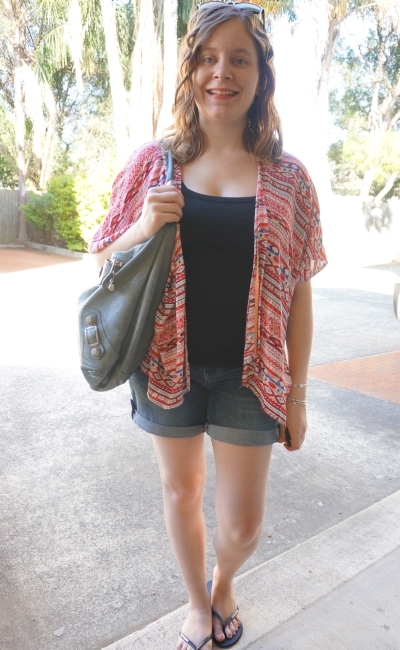 Love your casual chic look in kimono cardigans, they are so effortless! I love these looks. They look cute and still very functional! Both of your kimonos are so pretty! Love both of these relaxed looks! I was chatting with my girlfriend who just had a baby and her children are only 14 months apart about how she looks forwards to her bath even if it's every few days! I can't imagine how tough having 2 itty bitty is. You are amazing to keep blogging and looking great! I certainly hope i said congratulations on your little bundle. Lovely kimonos, love the prints and colors and just perfect with the jean shorts. A great staple! Kimonos really are a girls best friend! I love the vintage red on on you! so flattering.